Boasting the highest concentration of high quality climbing in the country, Mt Arapiles is a must for any serious rock climber. Situated in the central-west area of Victoria, the trek out here may be a long one but it's well worth it. With more than 2,000 climbs to choose from, this is a mountain that only very experienced climbers should attempt. If diversity of climbing is what you are after, the Grampians will be perfect for you on your campervan hire holiday. Stretching approximately 100 kilometres in length and 45 kilometres in width, the Grampians cover an area of almost 2000 square kilometres. The rock varies from grey sandstone to gorgeous orange and red quartzite, with the best time to climb during the months of Spring and Autumn. Mt Buffalo is a granite plateau in the north-western corner of Victoria and stands 1500 metres in height. Offering two main climbing areas, the terrain here is extremely steep and is not recommended if your forte is sport climbing. Snow falls in the winter so be sure to make the trek in the warmer months. The climbs at Point Perpendicular are extremely varied in style, rock quality, position and protection. This destination is all about adventure, and the Lighthouse area is always extremely popular. High winds are a common occurrence so ensure you are well prepared for sudden gusts. The Blue Mountains are one of Sydney's most beautiful nearby natural attractions. This huge sandstone plateau has been eroded by rivers and streams, creating an almost endless diversity of crags and climbing styles. Climbing is best in Autumn and Spring, however seasoned climbers could tackle it all year round. Surprisingly there is an incredible amount of climbing on Magnetic Island, making this a must while in the Townsville area. 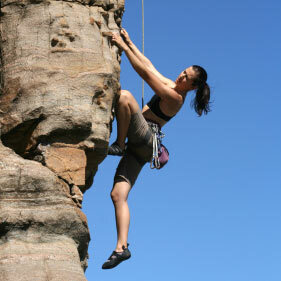 The climbing is on medium-large sized boulders and rock formations around the island's many bays. Coles Bay is probably one of the best known climbing areas in Tasmania, mostly owing to its natural charm and relaxed atmosphere. Visit from September to May and experience well protected climbs, all while enjoying the stunning natural peninsula. New and sporty, Kalbarri is fast becoming a hot spot for younger climbers. Located within the Kalbarri National Park, the sandstone cliffs here are ideal for climbing year round, with the summer months best avoided. Considered the best in the Northern Territory, Umbrawarra is located 240 kilometres south of Darwin on the Sturt Highway. The sandstone cliffs are perfect for climbing in the dry winter season, with around 30 routes on offer. Located within the Namadgi National Park, Booroomba offers some lovely cheese-greater slabs with good exposure. Boasting a wide range of slabs, cracks and faces, climbing can be a little unpredictable at times so ensure you are alert at all times. The best times to climb are during Spring, Autumn and the cooler months of Summer. Another great destination for rock climbing enthusiasts is New Zealand, and campervan Queenstown provides the perfect holiday opportunity to do this.